Isis has been in full pilot mode since October, but has the new technology affected any change to the way we make payments? Vince Horiuchi of the Salt Lake Tribune — and a recent Isis user — argues that the mobile wallet solution still has room to improve. According to Horiuchi, using Isis to make a transaction takes just as long, if not longer, as the traditional method of swiping a credit card. Inconsistency is also a concern, as Horiuchi reports that Isis transactions often returned an error code at the point of transaction. These concerns coupled with the relatively small number of retail locations currently accepting contactless payments in Salt Lake City — a list of 420 that currently excludes the likes of Target, Wal-Mart, Kmart and grocers such as Reams or Harmons — makes the shortcomings of the mobile wallet solution are evident. However, those with high hopes for the Isis mobile wallet should not fret over these drawbacks just yet, as Horiuchi also cites some of the advantages of the technology. Top of the list of advantages is Isis’ ability to draw users’ attention to stores running promotions and discounts. While the transaction time has not been drastically cut, you would be hard-pressed to find a credit card that points out retailers running sales or promos. Isis could very well be the price-savvy consumer’s best friend. The mobile wallet automatically collects virtual coupons as well as alerts users to deals at Isis-compatible retailers. Using a coupon is also simple; users just tap their Isis-enabled phone to the reader or display a bar code on the device’s screen that the cashier can scan. As Horiuchi points out, there is considerable commercial potential for retailers as they can send new coupons and deals straight to customers’ phones to be viewed all in one application. Marketing is key to any retailer and though only about eight stores offer such deals at this point, the value is there to be had. One notable deal gives Isis users free rides on UTA trains and buses through Jan. 31. 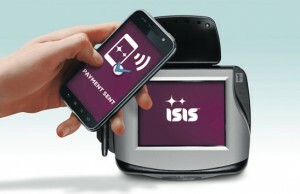 Security is a concern with any mobile wallet solution and Isis believes that it has provided more secure method than traditional credit cards. The solution requires users to input a PIN to launch the app. Additionally, every time the mobile wallet is used, the system scrambles the Isis account security number. Finally, tapping a phone to a reader provides additional physical protection that handing over a credit card to a waiter or clerk does not. Horiuchi raises a final concern that many who adopt the Isis mobile wallet are likely to have— what if I lose my phone? While a thief would need a PIN to open the app, customers would be unable to make a payment until a new phone was purchased— making traditional credit cards a necessity if only as a back up. It is worth noting, pros and cons aside, that the Isis mobile wallet is still in its pilot phase and as such there are still kinks to be worked out. Additionally, the technology itself — NFC — is still in the early adopter phase. That being said, the future of Isis is yet to fully materialize and the pilot in Salt Lake City will— if taken with a grain of salt— provide valuable insight into ISIS’ role in the payments landscape. Read Horiuchi’s full Salt Lake Tribune article here.